Oh dear! Wind is still in the East, no good for man nor beast! Mike Maguire the race officer ably assisted by Vice Commodore John Maunder had the daunting task of bad visibility, fickle winds and 29 yachts racing on Saturday 28th May 2016. The Cockwells sponsored Saturday series started off the club line and as the visibility cleared a soft South East wind allowed Minx, Charles Choak and Tai Mo Shan, Neil Chamberlain to start in Q class. They were followed 5 minutes later by 6 U class yachts who found a big hole in the wind on the start line. 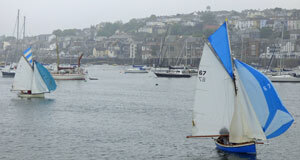 Two boats vied for position in W class with Sweet Friday, Len Cheshire leading Amneris, Mike Robson out of the harbour. Four G class yachts then started and went off into the gloom toward the eastern shore. On May 31st 1924 at 14:10 6 of 7 brand new Sunbeams raced in Falmouth Harbour for the very first time. Wow! 92 years later 5 Sunbeams started off the Frigate buoy for the Silver Sunbeam race with a windward-leeward course set by John Maunder. Whimsey, helmed by David Mantle and crewed by Neil Andrews went off and led for the race! 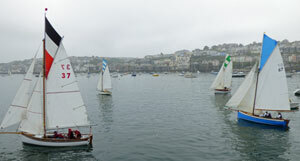 Nine B class Falmouth Working Boats came out for the start of the Grace & Gebhard trophy. One C class working boat, Leila, Adam Bird set off for the same set of trophies. In Q class, Tai Mo Shan sailed single handed led for most of the two buoy race and beat Minx both on elapsed and corrected time. On Trifle we set up for a port tack clubhouse end start. All the best laid plans! We were buried, running down the line on starboard, and had an auspicious start. Aurora, Mandy Owens got the lead closely followed by Wilkie, Bob Chapple, Ida, Mike Swingler, Mr G, Tim Dewhurst. Aries, David Mitchell was somewhere in amongst the bunch. Three tacks later Trifle caught a zephyr and went ahead closely followed by Wilkie sailing single handed. Trifle dived over to the eastern shore to catch the last of the ebb tide down to Castle Buoy and rounding to port. We set a starboard pole kite and went north to Vilt. Bob Chapple on Wilkie was seen working like a one armed paper hanger as he to flew his spinnaker. We rounded Vilt to port and Finn my 14 year old crew executed a brilliant gybe. We then held the kite to the finish off the clubhouse and took 1st place overall. Wilkie gybed but unfortunately had to drop the kite as he was headed. Never mind, he soon rehoisted and came a very creditable second followed by Aurora in third. Whimsey won the Silver Sunbeam trophy by two seconds with relative newcomer to Sunbeams, Nigel Glanville in Ivy having a great race. Pixy, Lyulph Hesling was 3rd and Julie Hopkins sailed Mary into a very respectable 4th. 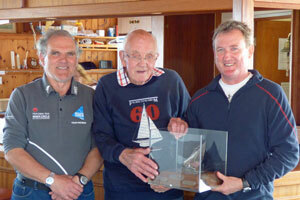 Amneris, Mike Robson beat Sweet Friday, Len Cheshire on Handicap in W class white sail fleet. Miss Agnes, Mike Rangecroft beat Katy, Sue Grigg and Delilah, Gary Pidwell beat Clementine, Alan Perham in G class small Gaffers. Grace, Dan Tregaskes won the B class working boats by a considerable margin on elapsed and corrected time from Mabel, Brian Chenoweth and Rita, John Peters. It was great to see all the brightly coloured topsails coming up the harbour. Adam Bird had a sailover in C class. We went into the club and had teas provided by Sally Beckett with dyslexic jam and cream scones. Thanks to Inez and Jeanette in the ops room and Sue Clark for the results. John Maunder for the harbour starts and bar. Puddles the Duck is doing fine with his new dad Giles.